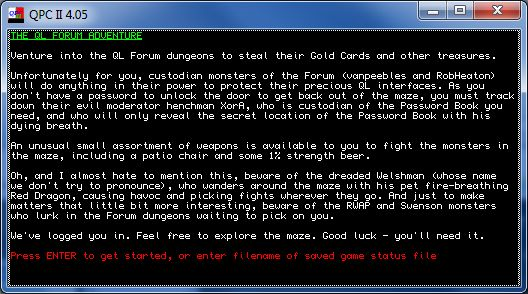 An amusing little text adventure created with Adventure Shell, all centred on the QL Forum. Raid the QL Forum dungeons to steal Rob Heaton and vanpeebles’s beloved QL interfaces, try to find the XorA’s password book to open the exit door and beware of assorted monsters such as The Dilwyn and his pet fire-breathing red dragon, Swenson and RWAP – collect weapons like a patio chair to fight with. Full of in-jokes about QL Forum. A nice example game written in BASIC showing what can be achieved with Adventure Shell (does not need the Adventure Shell itself to run). Written by David Denham (“dden” on QL Forum). Game state can be saved if you wish to suspend play at some point and come back to the game later. This entry was posted in News and tagged QL Forum Adventure on 03/05/2017 by Dilwyn.